BIGSSS PhD programs are sorted into three different categories (status) which mostly differ by the source of funding, curricular elements and PhD milestones. 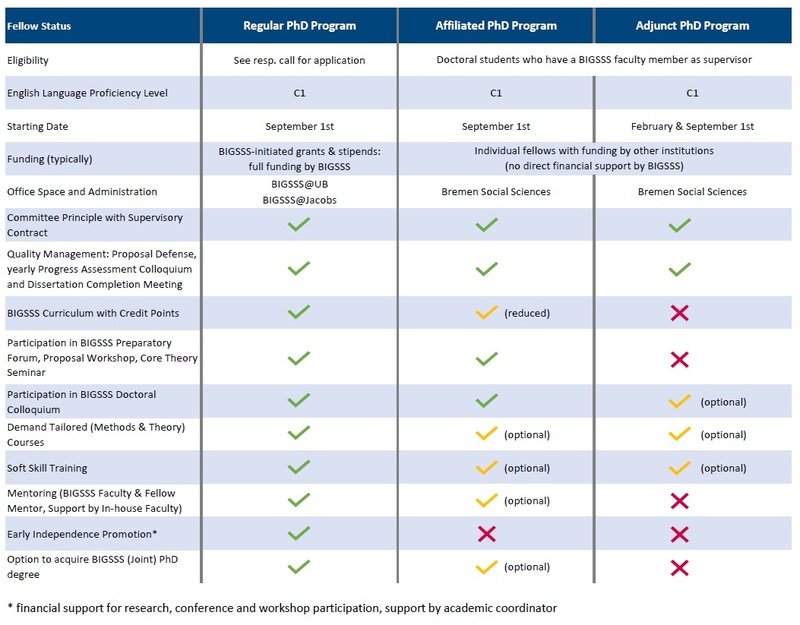 The Regular BIGSSS PhD is typically fully funded by BIGSSS or a partner institution. The eligibility depends on the respective program and the prospective call. Regular PhD fellows complete mandatory PhD milestones and are obliged to participate in BIGSSS doctoral courses. The Affiliated and the Adjunct PhD programs are open to doctoral candidates who already have a BIGSSS faculty member as their supervisor and work in the Bremen social sciences. Affiliated PhD fellows have a reduced curriculum and benefit from BIGSSS supervisory structure which entails in-house faculty support. The Adjunct PhD status provides a low-threshold integration into BIGSSS with an easy application process and no mandatory curricular elements. Nevertheless, during their time at BIGSSS, Adjunct PhD fellows complete several mandatory PhD milestones. Doctoral researchers can apply for the BIGSSS Adjunct PhD Program at any stage of their dissertation projects at Bremen. Download the BIGSSS Program Flyer (2019) with an overview on all BIGSSS programs.